Karina Oliva Alvarado - K's poetry is her water and sharing it, her breath. Born in El Salvador, she emigrated to the U.S., age four, and continues to live in Pico Union, known for its Central American population. From hardship and violence, she was made a warrior early on, yet her quest for social justice remains motivated by empathy. K's best learning emerges from mother-hood, gente and ancestor knowledge. Someday she hopes to bring on miracles of the mind, free the naked spirit, and nurture the human core. A visual artist, she remains committed to the spoken word and is grateful to the creative, intellectual, spiritual, and activist communities of which she belongs. Part of her academic focus is on Salvadoren/Salvadoren American cultural production related to place/memory/nostalgia informing identity politics. She's interested in hearing about your migration experiences through word/art. Anayvette Maria Bran Is the daughter of a Salvadorian father and Nicarag�ense-American mother. She strongly believes in the power of spoken word. As an activist, poet, organizer, follower of Yemaya and infiltrator at U.C.L.A majoring in Chicana Studies and Latin American Studies, she enjoys eating ripe mangos under a full moon and making love to her writing. Her inspirations and influences come from her colorful familia and two-spirited nature. She currently stands as "La Mera Mera" of La Gente newsmagazine, and continues to let the world have it palabra por palabra. Adriana Cabrera-Garcia - Encourages creativity as cultural resistance! Born and raised in San Jo, Cal, she throws the spoken word with the California "END-Dependence Poets Collective." She graduated from SJSU majoring in public relations, with a minor in Chicana/o Studies last May. She is one Chicana reggae lover who can do it all...baila, pinta, escribe, sonr�e, and creates! As a cultural worker and political activist, she has initiated multiple projects addressing the Chicano community among students, youth and the working-class. She has recently begun organizing efforts within the Filipino community as well...on the theme of art and spirituality. In addition, being involved in numerous collectives working with the youth and drawing from her personal experience, she uses and promotes art for self-healing and community transformation. Johnny Chavarr�a is an Hondure�o poet/rapper, activist and 'maestro' from the Mayan coast 'de la Ceiba.' He is an undergraduate at U.S.C., but he'd rather tell you that he works with the youth of South Central Los Angeles. Johnny is passionate about making social change a reality. His smile radiates energy, and his lyrics inspire others to want to take a stand against all forms of injustice. He is definitely a spiritual brother on a quest. Camincha is from Miraflores,Lima,Per�. Calls the United States her second home and keeps close to her roots for she feels that "it is much easier to get where you want to go when you are proud of where you come from." Earned her M.A. in 1987 in Spanish Literature at San Francisco State University. Was selected by KDTV for their segment "One of Ours" to honor her contributions to the Latin American community in the Bay Area. Her poems,short stories and translations have been published in English and Spanish on Lit & E-Zines magazines. And has desktop published three chapbooks. The San Francisco Bay Guardian,says: "Camincha frames the ordinary in a way that makes it extraordinary, and that is real talent." Janssen Chavarria was raised in South Central, Los Angeles. He was originally born in the Mayan Coast of La Ceiba, Honduras and immigrated in 1984 crossing Babylon's walls. He's motivated to make social change a reality by working with youth in the inner city, and hopes to create a community center that opens the doors to artistic minds. Janssen is currently majoring in International Development and Latin American Studies at UCLA. He is a rapper, poet and teacher of the Creator's love, who writes to reach souls and bring honor to all who fought before us because he believes our past history is extremely important in order to formulate our identities. Mark Gonzales - A member of the original End-Dependence tour, Mark is a spoken word artist and prison abolitionist currently infiltrating UC Riverside as a student. Raised by his father since 1989, Mark moved from Alaska to Colorado, then to California. As a member of the 2001 Long Beach West Coast Slam Champions, Mark witnessed the power of words to move masses and dedicated himself to doing so. As founder of the Civil Writes Project, he assists in the development of radical methods of re-education through spoken word based curriculum; as co-founder of The Non-Prophets Poets, he works with at-risk youths to emphasize self-expression as a form of self-actualization; as a member of Mic and Dim Lights Alumni, he travels nationally with other artists to universities, conferences, and classrooms to advocate Social Justice via spoken word and the arts. "Poetry is more than art, it is audio liberation. For we are the voices that will no longer subject themselves to the state violence of silence." Gabriela L�pez (a.k.a. Sasparella) - Mexicana artist/actor/writer, was born and raised in Norwalk, CA in an artistic and musical family. Writing has been her main form of self expression all her life, and was a member of the original End-Dependence Tour. She has been published in a few anthologies throught the years, has participated and conducted writing workshops and open mics in Whittier and presented a motivational arts workshop for high school girls at the "1st Annual Young Women's Empowerment Day" at Rio Hondo College. In 2001, she released her first self-produced poetry cd, "Sasparella: Words & Music" with the help of music producer Shug. She has performed her work most recently at CASA 0101. Currently she's developing a performance art piece for TeAda Theater Productions titled "Apparitions of the Virgin Mary" scheduled to open late August. When she's not writing and performing, Gabriela also co-owns a graphic design firm, Soap Design Co. in Los Angeles. 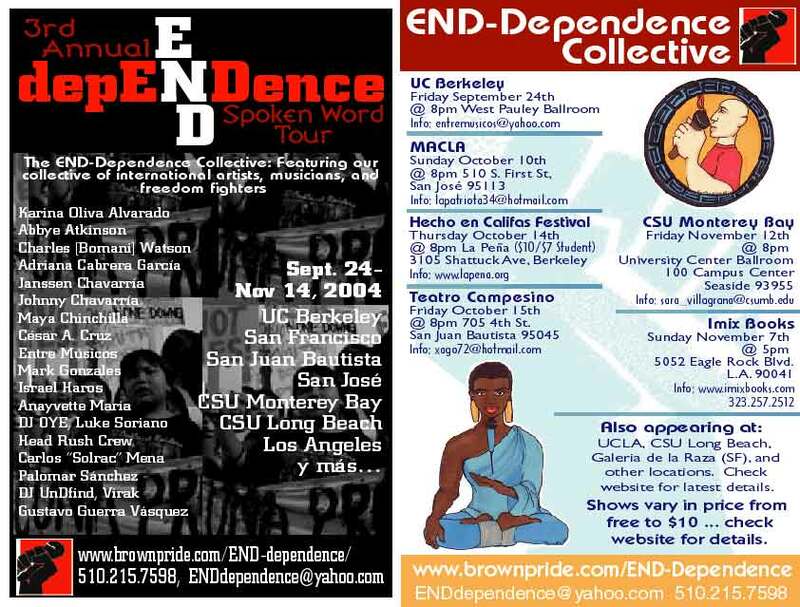 She would like to thank the END-dependence Collective for their continuing inspiration and collabo! Charles (Bomani) Watson currently resides in Los Angeles, California. Born and raised in Milwaukee, Wisconsin, he first began writing as substitute for conversations he didn�t have with his father as a youth. Sharing his stage time as a performance poet, he earned a BS in Electrical Engineering. Bomani is also a photographer and member of A Mic and Dim Lights collective traveling the U.S. performing spokenword in various cities. His writing encompasses a unique blend of social-politics, reality, fantasy, hip-hop, and love. He is currently working on several spokenword projects including his own CD. Adriel Luis, Is a Chinese American poet from the Bay Area scene. Born in '83 and raised in Union City, CA, he grew up with the steadfast principles of capitalism, social acceptance, and success through standardized evaluation, institutionalized deep within his persona until his unleashed passion for poetry and spoken word woke him up from the Amerikan Dream and helped transform him into the raving yellow-skinned nightmare he is today. His newfound perspective in life was nourished through running with the L.A.V.I.S.H. (Lifeforms Achieving Valence in Shaping Hip-hop) family, and he is now also an affiliate of the Youth-Speaks Bay Area spoken word organization and CAPAA (Council of Asian Pacific American Affairs). Adriel was a finalist in the 2002 Bay Area Youth Poetry Slam. His current projects include working on his solo debut album, The Life and Depth of Adriel Luis, and his first chapbook, Cutloose. When he is not looking for love in the Bay or within the restlessness of himself, Adriel can be found at the University of California, Davis, working on his Bachelor of Sciences in Community and Regional Development, with a certificate in Asian American Studies. Palomar Sanchez Is a Xicano slam poet from the Bay Area who is taking UC Santa Cruz by storm. He has been raised to be a human rights freedom fighter. His no holds barred approach both inspires and gives hope to the youth. He is not afraid to bring it 'on the real' and is willing to put his body on the line to even shut down the infamous "School of the Assassins (Americas)." Ruby Veridiano, a.k.a. Tali Amani - Although Ruby is new to the spoken word scene, her work isn't any indication of it. Her ability to intertwine words to paint images makes her poetry not just a joy to hear, but also to visualize. Influenced by her awe of underground hip-hop, she transcends the beauty of its culture through her writing and performance. Ruby has also begun tapping into her Filipina roots, taking her own experiences, as well as her developing knowledge of her culture and background to scribe poetry that is as personal as it is beautiful.